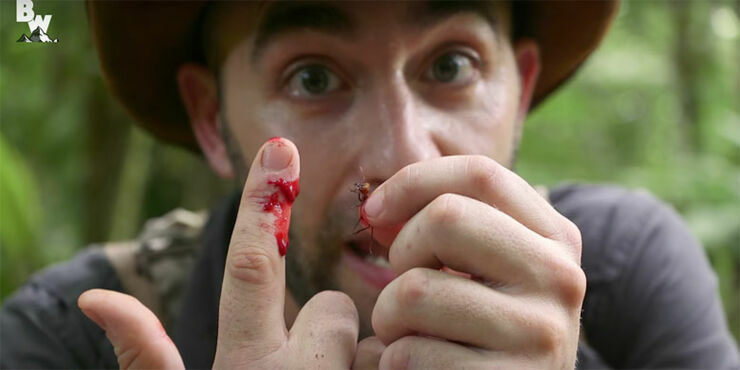 YouTube wildlife presenter Coyote Peterson, who previously has gotten adorably nuzzled by a wild ocelot, now takes on a much more, well, unfriendly foe. As part of his Breaking Trail show on YouTube channel Brave Wilderness he's been searching out the most badass types of ant species. So he decided to test out the infamous bite of the leafcutter ant, a species found in the American tropics who use their very sharp jaws to clip segments of leaves to use in their underground nests. It's also reported that their jaws can cut through human skin, so Peterson decided to test out that hypothesis by seeing what damage they could do to his finger in 60 seconds. A decision he know doubt regretted, because before long the ant is having at it with his finger, tearing into it until it resembles a massacre, blood pouring out everywhere. His conclusion? Yeah, the leafcutter ant can slice through human skin. He gives it an 8 on the ant power scale which he's collating. His next challenge? The bullet ant, an ant with a powerful sting and venom so strong that it's said being stung by one is the equivalent of being shot, hence its name.